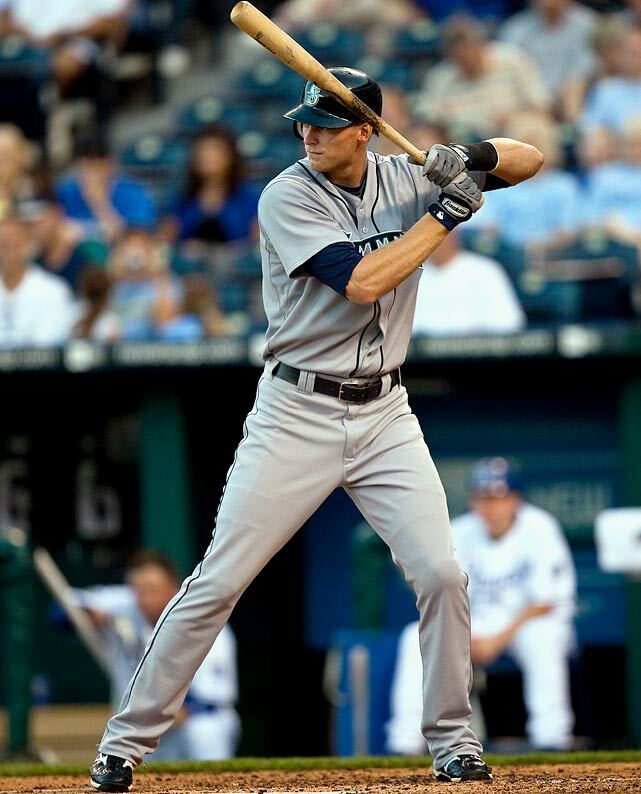 Mariners Latest: Michael Saunders! Enough Said. Saunders Carries M's To Victory! What a game! Seriously, the best game of the year in my opinion. The Mariners got off to a slow start offensively, but really came through in the clutch on a couple of mishaps by Toronto's defense. Through the first five innings the Mariners couldn't manage to get a hit off Toronto's starter, Ricky Romero. The M's found a way to tie the game at 1 a piece in the 3rd without the aid of a hit, but Toronto struck back in the 4th with two runs. The score remained 3 - 1 until the seventh inning when Jesus Montero led off the inning with a solo homerun to make the score 3 - 2. Later in the inning, with two outs, Miguel Olivo singled and Casper Wells followed with a deep double that scored Olivo from 1st base. All of a sudden, the score was knotted at three. On to the 8th. Tom Wilhelmsen came on in his role, looking for a quick 1, 2, 3 inning and didn't find it. With one out Eric Thames hit a homerun to right center and the next batter, Brett Lawrie hit a single. He would move to third on a failed pickoff attempt by Wilhelmsen and later score on a sac fly. Now the Mariners were down 5 - 3 going in to the top of the ninth. Not particularly a place that the M's have excelled in lately, but tonight, we received a little help. Top of the ninth, Alex Liddi flew out to right field and left the team with two remaining outs to get two runs. Michael Saunders took things into his own hands and sent a ball deep into center field that cleared the wall for a homerun and put the Mariners back by just one. Miguel Olivo popped out for the second out and the M's had their final shot. Kyle Seager pinch hit for Casper Wells and hit a routine ground ball to third base. What should have been an easy out to end the game ended up being a ball thrown on a hop by Brett Lawrie to Adam Lind and Lind couldn't scoop it. Mariners live for one more chance. Munenori Kawasaki pinch ran for Seager and Dustin Ackley came to the plate. Catcher J. P. Arencibia tried to pick off Kawasaki at first and totally overshot Lind and sent the ball all the way down the right field line. Kawasaki wound up on 3rd base and that made a case for Francisco Cordero to intentionally walk Dustin Ackley. First and third, two out and the M's decide to pinch hit John Jaso for Brendan Ryan. Jaso, on a 2 - 2 changeup lined a ball into center field. Colby Rasmus charged in to make a diving attempt but the ball reached the ground before he got there and ended up hitting the heel of his bare hand, pushing the ball forward. Kawasaki scored easily from third and Dustin Ackley went wheeling all the way around and attempted to score. The second baseman Kelly Johnson picked up the ball from shallow center and nailed Ackley at the plate as J. P. Arencibia tagged his right shoulder before Ack could reach around and slap the plate. That ended the inning and sent it back to the bullpen of the Mariners. Tom Wilhelmsen came out to pitch the ninth and ended up getting the first out and then handing the ball over to Charlie Furbush. Furbush collected his two outs and sending the game into extra innings. These are the moments, the games that people don't forget, the kind of games that you only dream about being a part of. Today, it was a dream come true for Michael Saunders. Ichiro led off by grounding out and capped his 0 for 5 night. Justin Smoak singled to left, Jesus Montero singled to left and Alex Liddi singled to left. That brought up Saunders. On a 1 and 2 pitch from Luis Perez, Saunders launched a ball to right field that was a total moon shot. I jumped up from my seat, knowing that he did his job and that a run would score, but the ball kept going. Jose Bautista was tracking it the whole way it seemed, but he finally turned and watched the ball sail over the right field wall. A GRAND SLAM HOMERUN? I couldn't believe it. I don't think anybody could believe it. Saunders with his second homer in as many at bats had become the hero. The first grand slam of his career and that put the M's on top 9 - 5. Brandon League came on to close out the game in a 1, 2, 3 bottom of the tenth and the Mariners sealed another victory and went above .500 once again. All of a sudden, the M's look like a completely different ball club. A team that is hitting, a team that is refusing to give up and a team that is winning games. This kind of baseball is what we've been waiting for. I'm really trying not to get too excited too early, but how can you not after games like today. Now tied with the A's for second with an 11 - 10 record and 4.5 games behind the Rangers who are 15 - 5 after losing today. The Angels have now lost 5 straight games and sit at 6 and 14 and 9 games back. The Angels also cut ties with Bobby Abreu today. All in all, the Mariners have found their MOJO once again and today it came in the form of a Michael Saunders solo shot and grand slam. We'll take 'em any way we can get 'em, but this win was just epic. Let's keep it coming Mariners, release that inner MOJO!